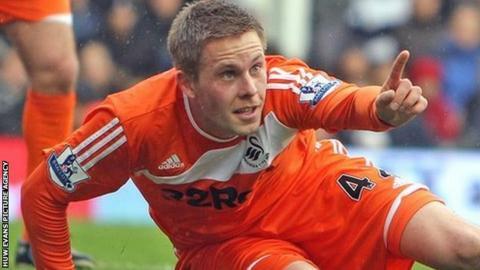 Swansea City chairman Huw Jenkins admits it will be a struggle to keep hold of midfielder Gylfi Sigurdsson. The Iceland midfielder is on loan from Hoffenheim until the end of the season and has impressed with Swansea, scoring seven goals in 14 games since January. "He's done a great job for us and is still only young. Our aim is to keep our best players," Jenkins said. "We've always tried to do that over the years and it will be no different with Gylfi." Sigurdsson, 22, played under current Swansea manager Brendan Rodgers during their time at Reading and has taken little time to settle in at the Liberty Stadium. The player has also said he would be happy to stay at Swansea beyond the end of the current season. "The fact is when you take a player on loan, control is out of your hands," added Jenkins, speaking to the BBC's Radio Wales Sport programme. "They [Hoffenheim] wouldn't commit to do a deal before we took him, which we would have loved to have done. "But we've got to hope that his relationship now with the club [Swansea], with the players and with Brendan has helped him in the Premier League, and he sees us as a great option next season if he's allowed to leave his club in Germany. "No doubt there's going to be a bit of a battle on our hands to secure his services for next season. "The other thing is they've had a change of manager as well and he's still contracted there for a couple of years. "So you've got no guarantee either way really, whether he'd be allowed to leave yet." Another key member of the Swansea side is defender Stephen Caulker, on a season-long loan from Tottenham Hotspur. The England Under-21 international has formed an impressive partnership alongside Wales star Ashley Williams at the heart of the Swansea defence. While it is unlikely that Spurs would be willing to sell the 20-year-old, Swansea remain hopeful of taking Caulker on another long-term loan next season. "We would have loved to have bought Stephen Caulker a year ago but that wasn't to be," Jenkins said. "They allow players out on loan and we've got to accept that, but if the opportunity arose... it'll be another great signing to bring in next season. "Steven has settled in really well and he can look back on a fantastic season for himself." Swansea stopped a run of three defeats with a comprehensive 3-0 home win over Blackburn Rovers last weekend. That result mathematically ensured Rodgers' Premier League new boys will line up for a second season in the top flight. Swansea travel to Bolton on Saturday, with games against Wolves, Manchester United and Liverpool to finish the season.